This was posted 5 months 4 days ago, and might be an out-dated deal. Black friday savings on Anova Precision cookers. $70 off the wifi model. I was a skeptic at first, but after doing a whole bunch of scotch fillet steaks with this I can't go back. Recommended! I got the bluetooth + wifi model but never use that function. Still good though as this is the more powerful unit and can cook for more people if you need it to. Yes, it's hard to believe it can be even half as bad as they've managed to make it. I use the WiFi all the time. I get Cape Grim steak in bulk, season and vacuum seal then freeze. I use an Esky for my water bath. I put the steak in the bath before I go to work along with 2 giant bricks of ice I've made using silicone loaf pans. The water temperature drops and stays below 4C for the whole day. I use the app to start it cooking a couple of hours before I head home and when I get home, the steak is ready to sear. btw Black Friday is on Friday, November 23. 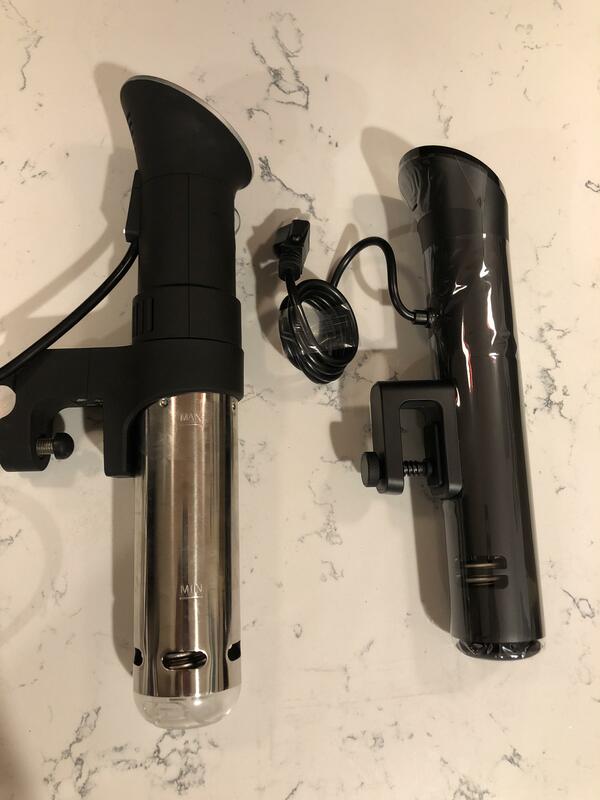 I've got this and have recently purchased this, https://www.kogan.com/au/buy/kogan-multi-cooker-sous-vide-fu..., as I wanted a slow cooker. I kinda prefer the Kogan multi cooker. Have used it for suos vide too and worked well. Anova one works well too, but Kogan one more practical if you have the bench space. Practicality depends on your usage though. I have a 25(ish) litre esky that I use with my ANOVA. Do meals for 6-8 people regularly. Have cooked protein for 25 people using it. 6l capacity wouldn't be practical for me. Seems that the ANOVA would take up less space too since you can just use a pot to cook in if you only need a small capacity. But I guess if you're using the other functions on your Kogan cooker then you're saving space on all the different appliances. I bought a Bluetooth model a few months back and ended up getting it for free. I was originally going to return the unit under their 60 Day return policy, nothing wrong with it, I just didn't think I'd use it much. Initiated the return process, they wrote back saying no need to return, keep it as a gift. They refunded the money on the same day. I suspect it was because it was an older runout model (the metal Bluetooth model). @furythree: Can you point me to the reviews you've read? Most I've seen have been pretty good. This looks like a classic case of "we are now mainstream so lets release the el cheapo plastic made in china version"
@furythree: Ah I see what' you're talking about. I was going to get the wifi version, but the size of the nano is so much better for me. There's a 100-day money back guarantee, so I'm going to give it a go. So does the precision cooker come with an Australian plug and works on 240AC? Assuming it does but could not find any doco. Was tossing up between the two, but will probably go the nano now that I've seen the size difference. A shame they no longer sell the Bluetooth only model. I looked just lasy week & made the mistake of waiting for BF sale. Is this a good price for the Bluetooth/ wifi? I assume the ‘plastic’ one is the new nano? Just got an email - maybe can update post with new code? I think there's a minimum spend for the code to work ? Just tried it on the bigger ($149) model and code doesnt work. The email says it only applies to the Nano - don't think it works on the older model. I find it pretty ridiculous that they say the smaller one is 1-4, and the other is 12. I can't imagine you'd see any difference, despite a paper difference (100 watts). If I was buying now, I'd buy the cheaper one for sure. Only reason I wouldn't is if you need wifi. I rarely use this though. ah ok, thanks for that. The "original" (non-Nano) model allows you to adjust the height (ie. how far the machine is submerged). On the Nano the height is locked. The offer for the WiFi enabled one has expired?